All foods are assigned a PointsPlus (PP) value, based on the carbohydrates, protein, fiber, and fat grams that they contain. For example--an English muffin has 3 PP, two tablespoons of peanut butter has 5 PP, and a cup of skim milk has 2 PP. You are given a PP target to aim for each day--for example, my target is 32. That means I can eat 32 PP worth of food each day (I can go over that, which I will explain later...). Your target is personalized to YOU, so yours may be different from mine. Weight Watchers does have "Good Health Guidelines" that they like you to follow when you spend your PP (for example, getting two dairy servings a day), but I won't get in-depth about all of that right now. Basically, you can spend your PP however you'd like, as long as you eat your target amount of PP. Most fruits and vegetables are 0 PP. The starchy veggies like potatoes, corn, and peas are not 0 PP. I like to use these foods as fillers, to have along with a meal and fill me up. You are also given a weekly PointsPlus allowance of 49. Those can be used at any time during the week, and you can divide them up however you'd like. You can use them all in one day if you have a special occasion, or you can have seven of them every day.... or you can choose not to use them (I personally recommend that you DO use them). You can also "earn" more PP for food by doing activity. For example, when I run 4 miles, I might earn 5 PP. I can use those earned PP however I'd like. You don't have to use them, but again, I personally recommend using them. Your daily PP target cannot be carried over from day to day. For example, since my target is 32, if I only use 30, I cannot carry over 2 PP to tomorrow. You should try to use all of your target PP each day. Similarly, you cannot carry over your weekly PP. If you don't use all 49, then on the starting day of your week, you automatically get 49 again. Activity PP can be used any time during the week that they are earned, but cannot be carried over to the next week either. Basically, your slate is wiped clean at the start of each week (my weeks start on Wednesday, my weigh-in day). Obviously I am lacking in the vegetable department, but this is an honest typical day for me. I tried to pick a day where I ate on the lower side of my target PP (usually, I eat at least 40 PP per day, because I use all of my weekly PP and activity PP every week). So, those are the basics of the program. Pretty simple! Now, my thoughts on the program... a lot of people want to know if I think it's worth trying. I don't want to say yes or no to this, because it totally depends on the person. Weight Watchers isn't magical; if you're having a hard time eating healthier, or counting calories, or sticking with any program, then Weight Watchers probably won't be much different. It still requires US to do the work--they just give us the tools to do so. Weight Watchers isn't going to be the one making food decisions, so I can't say whether it's the right program for you or anyone else. Here is an updated version of the positives and negatives (in MY opinion) about WW. I like that the numbers are small--counting PP is MUCH easier to track than counting calories. I love that fruits are "free"--I've said it over and over, but grapes definitely helped me get through the first few weeks on plan! With free fruits and veggies, there is no reason to ever be hungry. I do tend to make healthier choices, since they are lower in PP values. You don't have to give up any foods--you can eat anything you want, if you just count it. You can fit any food into your plan if you plan for it! At the meetings, you get little rewards for milestones, like 5% lost, 10% lost, 10-lbs, 25-lbs, etc. Maybe it sounds lame, but it's kind of exciting to look forward to that reward! The meetings are expensive. And even the online program is expensive. (Check with your insurance company, however, because a lot of them pay for it now!). However, if you're frugal like me, then spending that money might actually help you stick with it. I would have quit on Day 1 if I hadn't spend $60-something for the online program. It can take a lot of time when you're getting to know the program--calculating the PP values in all of your regular foods, your recipes, totaling everything up and either writing it down or entering it online. Once you get used to it, it's not as time consuming, but it still takes some of your time. It's tempting to find ways to bend the rules--like with the free fruit. "Technically", you could eat 10 bananas for breakfast and still be on plan--but we know that 10 bananas contains a LOT of calories! So I think it's important to be honest with myself while following the program. If I swipe a spoonful of peanut butter from the pantry, well, I have to count it. That seemingly harmless spoonful has 225 calories! Another question I was asked was about the meetings--how public the weigh-in part is. I wouldn't let this intimidate you at all! There is a tall desk, with a few receptionists behind it. On the floor, in front of each receptionist, is a small scale (without numbers on it). You just step on the scale, but the numbers only show behind the counter--so YOU can't even see what your weight is, let alone anyone else in the room. If you're uncomfortable with anyone knowing your weight, it's very easy to keep it a secret between you and the receptionist. And if you're shy, like I am, you can let the receptionist or leader know that, and they won't (or shouldn't anyway) make you feel uncomfortable at the meeting by asking you questions and all that. I guess that pretty much sums it up! I didn't intend for this to be so long, but it's hard to fit everything in. I'm not promoting Weight Watchers in any way, because if someone isn't ready to take control of their eating habits, then WW isn't the answer. But if someone is looking for something different to try, and it sounds interesting, then I'd say give it a go and see! 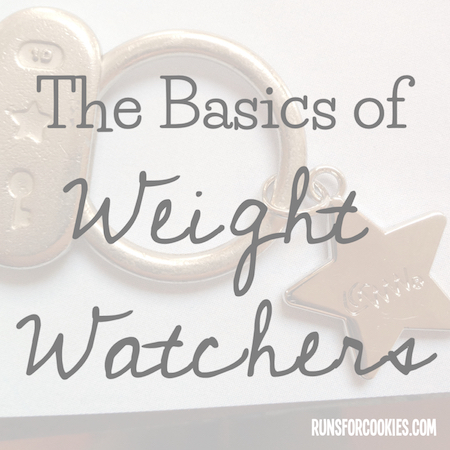 If you're a Weight Watchers member (now or in the past) I'm curious what you think... feel free to weigh in on your likes and dislikes of the program. I started the online WW program about 3 weeks ago.. mostly because of you and your blog! It was working for you so I thought it wouldn't hurt to try it. I had tried counting calories, but I got bored with that after awhile. So far, Weight Watchers helps me or "reminds" me to eat more fruit and veggies because like you said, they are free points and it helps bulk up your meals or snacks. Eating more fruit/veggies is certainly something I needed to work on, so that has been a big plus. For me, it makes me think more about what I'm eating, instead of just mindlessly grabbing something. Something else I really needed to work on! I just started Weight Watchers last week! I'm really loving the online tools. Counting points is so much easier and less stressful than counting calories (or it is to me at least). I've yo-yo dieted my whole life and I can honestly say that this has been my best "first week" ever. I have been on and off Weight Watchers for 6 years and you definitely see results if you put the work in by tracking, eating healthy, and exercising. I haven't been doing well lately but I know it is because of my choices. I like the meetings because you get support and ideas from other members. One thing I think they could do better on is focussing on the emotional side of eating and binge eating. I realize we need treats from time to time but I don't think they explain a snack vs. treat very well. Meaning 100 calorie packs of chips do not make great everyday snack but should be occasional treats. Also, I think they should focus on supporting people eating real food even if it is a little higher in PP over low PP foods that have been made in a lab. I found that I used to go for the food that was lowest in PP even if I didn't know what was in it/how it was made. Now I try to avoid most "edible food type substances"
Have you tried the new Points Plus program? Weight watchers has really geared it towards making healthier choices. Many of the foods that use to only be 1 point are now like 4 or 5 because of the nutritional value. Now it seems that foods with lower points are more nutritional. Also, the new 360 plan is adressing more of the ways to make eating healthy a lifestyle and not a diet. If you haven't joined in a while, I would check out the new program. I joined WW yesterday (online), also because of you. The biggest thing I noticed today was how quickly I changed my mind about a food I was about to eat because it had so many PP! I made eggs and biscuits for breakfast, and usually I'll have two biscuits. However, at 5pp each, it was easy to be satisfied with one. I've never done Weight Watchers before, although I've had relatives that have. I really like how the points are not just based on calories, but on all the nutritional aspects. My question; however, is whether or not Weight Watchers is still selling their boxed desserts. I remember a few years ago, my mom would buy Weight Watchers Lemon bars (like twinkies) and though they tasted AMAZING, their only upside was that they were low in calorie. (70 cal.) The ingredients were full of processed junk, and they weren't filling. Has WW changed since then? Unfortunately they still sell all that processed junk and I see some members stock up on it weekly. They definitely still sell that food, it usually includes sweeteners instead of sugar hence why it's low in calories. But you don't have to buy it! I've been a member for a year & I only bought one WW product (hot chocolate) to try it, & that's it. I can't afford their products, they're pretty pricey. Also, if you're label-savvy you can often find other foods which are very similar (or even lower!) in calories that are cheaper. But the beauty is you don't have to buy it, you can do WW and eat the food you choose to. I love WW! I've successfully lost weight using the program many times...it's the maintenance that I'm so bad at even though WW has a great maintenance program too. I think you make a very valid point...WW is great if you're ready to take control of your eating habits. I've been on PP WW since the beginning of January and have lost 22.6 lbs and plan on losing about 100 more. Once your mind is set to it, whether it's WW or not, you can do it! I have definitely done WW a number of times, some successful and some not. After you started talking about it recently and said fruits/veggies were free I decided to give it a try. The first week was a little difficult to adjust seeing I have been doing the whole calorie/fat/carbs/protein for years. I actually find with the new PP program it is a lot easier to not go hungry. At our meeting location (it's a fairly new one) each desk has a circular room divider so nobody can really see you. I like that, but even the old way wasn't bad either. I think WW workers and leaders know what it is like to be there. You are right though, if your not ready to make the change it won't work. I've been doing WW since May and I've been fairly successful- down 35 pounds so far. I haven't been enjoying it lately since the 360 started. And I don't know if it's purely because I don't like the new focus, or if also being out of work for a few months has just made me cranky in general (this is partly the case). I'm going back to work in 2 weeks, so I'm hoping my mood and attitude towards WW will pick up. I think I'm gonna take off next week for the meeting though. I'm so not in the mood for a portioning meeting. I know how to portion food out. I do find I hate the meetings most when it feels like it's going over the basics. But overall I like it because it does promote healthy eating and making real lifestyle changes, not just "dieting." I'm not sure it's great for athletes sometimes though because I feel like it punishes carbs, which even when they're whole grain, I feel like the point value is too high. It's definitely not a miracle plan. It only works if you work it. I started Weight Watchers 2 weeks ago and I love it. I love the new program! I'm a former weight watchers member. I loved it at first when I was able to eat 39 PP per day, but as I lost weight, and PP, it was way more difficult. When I stopped, I had 28 or 29 PP a day and I felt like I couldn't hardly eat anything! Also, at first I loved the free fruits, but eventually realized that, for me, free fruits was equaling to me eating 29 PP of junk! I guess it is all in the choices I was making, but u coin it very hard at the end. THANK YOU for recommending using the extra PP and activity PP per week. I've done WW three times, and the past two times I failed because I thought it was a contest to see how few PP I could use, and lose weight the fastest....umm no. Nooo. Please use them if you need to people, seriously. This time around, I have a completely different mindset than I have had in the past, and am using my PP when I need them, whether it's on a yummy splurge, or I am just still hungry at the end of the day. Weight Watchers is successful because of it's flexibility...so utilize that. I am so happy this time around with Weight Watchers and the weight I am losing. I love WW mainly because of the zero pp fruit & veggies but also - as you said - it is easier to keep track of than calories. I do not like guesswork when it comes to staying on plan so I like the support things they have like the pp calculator app. It is expensive so I just joined for 3 months to learn the plan. So far I've lost 25 lbs. I would encourage anyone just starting that the tracking and planning gets much easier as time goes by. I LOVE Weight Watchers! I've been a member since October 21, 2009. That day was so important, I will never forget it and the courage it took to take the first step. I've lost 260 lbs on my journey (225 lbs with WW), and I WW has been so instrumental in my journey from the easiness of the program to the great support that I have received from my meeting. I travel a lot and since there are meetings everywhere, I can always catch a meeting and I love the family feel that WW gives you even when you are far from home. I also love the app and online tools- very easy to use. Ultimately, it is like any weight loss program- you get out what you put in. If you work the program properly like keeping your GHGs in line, you will succeed. If you don't track, you most likely won't lose consistently- at least that's what I've seen. Glad you liked it this go around! I also have had success with WW. I have lost 65 pounds in the last couple years. I haven't gone to meetings or used the online site. My husband was very resourceful and looked up all the formulas online and created an excel spreadsheet for it. He also lost 25 pounds. One of my struggles all along has been I have not been able to use my activity points or extra 49 points without my weight loss stopping. So for me I have to stick to my daily allowance which is now pretty low even though I still have about 20 pounds to lose. Overall I think WW is a great program and if I had the money I would definitely consider going to meetings. I bought the materials on eBay. I really can't afford the meetings but my hang up is I work 3 days a week, 14 hours a day, it's hard to pack food for the day and most of the time options for healthy eating out are lacking. I'm also limited to mostly cold foods because we don't always get access to a microwave to heat up food, also time doesn't always allow. I'm a paramedic and we don't have quarters so it's very difficult. Lots of challenges so I have to figure out how to make it work. I'm a WW member here in NZ, but I'm pretty sure the ProPoints programme is the same or very close to PointsPlus. I'm ~ 2 weeks short of my one year anniversary, & I'm 100g from goal. Total loss when I reach goal will be 21kg (46 pounds). I really love the programme, it has helped me be disciplined with my food, and tracking in particular is fantastic. Because I'm only just over 5ft, I get a points allowance of 26 per day, but I tend to eat all my weekly 49 as well during the week as 26 just isn't enough I find. I also earn quite a few activity points. I would definitely recommend WW to someone who needs help losing weight, but I agree you really have to be in the right mindset to do it. For me, losing weight took hard work & sheer determination, but WW did make it easier. I'd highly recommend staying for meetings if you're a meetings member, plus weighing in every week - don't miss a weigh in because you think you might gain. I never missed a weigh in even if I was in another area of the country, I just looked online for a meeting to go in that area and went. I don't buy any WW products or food, I can't afford to, so I've done the programme eating "normal" food. Also, it did take a while but I figured I'd rather eat how I want to eat for the rest of my life, & still include foods I love but just in smaller portions. I know of people who've lost 20kg in 20 weeks with WW. Everyone's different at the end of the day. I became a lifetime member back in the dark ages! I am not sure what year it was but I'm going to guess 1986. The program was built around exchanges back then: Protein, bread, vegetable, fruit and fat. Each category had a certain number of exchanges per day. The program worked and I learned how many ounces of food makes up a portion and how many portions of things you need each day. Back then it was $4.00 per week and a few weeks before I became lifetime the price went up to $5.00. I kept my weight off for several years, but I never lost all my weight after my 2nd baby. I went to a few meetings after the program switched to points and they had the slider thingy to determine points values. I lost some of the weight but wasn't at goal but fortunately, I didn't gain it back. I got my weight back down a few years later when I started running again and working out. I just finished up two years of full time college, during which I gained 15 pounds. (My running mileage went way down and I spent a million hours per week sitting in a chair in the library doing homework and research.) When you began blogging about the new points plus program, I went to a meeting to get all of the new materials - because you can do that as a lifetime member! I was absolutely shocked that the price was 14.00 per week. I only went to 1 meeting so only paid 14.00. I also bought the little points calculator, which I use nearly every day. I've been doing it on my own without going to meetings and am almost back to my pre-college weight!! My running mileage is back up too, which means I earn lots of activity points!! Most weeks I don't use all of my activity points. So, yes, I've had success on three different versions of the WW program. I guess I was lucky that all of my meeting experiences have been positive. You have to be ready to make the changes in lifestyle and eating habits for it to work but when you do that, it works. That's my experience with Weight Watchers. How did you get 32 points as a target? Is that a maintenance target or a weight loss target you set personally based on trial and error? Also, do you use the online tools a lot? Even though I enjoy technology, I still prefer tracking in a notebook. Just curious. PS I think eating low calorie/highly processed food is an important step towards weight loss for many people. After losing weight on the processed stuff, many people gradually transition to the whole foods. I think small changes at first make it easier for people. I do think the program changes from when I did it 13+ years ago help you to learn how to eat healthy. I like that fruit is free. I am not crazy about the tracker and how it scrolls but that is a whole different thing. And the new plan does put a bigger emphasize on activity which is positive. I have been a successful lifetime WW member since 2006. I think one of the most important things for me was having a leader that I really liked. I continued going to her meetings for about 4 years while maintaining because it really kept me on track. Her meeting was canceled, so I tried others, but none of them "clicked" - probably because those leaders weren't with me on my weight loss journey. I still believe it's a great program, but like you said, they can't do the work for us. The accountability (stepping on the scale every week) was a great motivator for me. And how important is activity? I just spent 3 weeks in Hawaii, eating out EVERY meal, but walking everywhere (we didn't have a car) and running several morning a week - I weighed this morning and was happy to see I maintained my weight! That is the great thing about activity points. I only gained 0.2 lbs on a week of vacation because I also had to walk everywhere. The only downfall was that my feet were killing me by the end of every day. Haha. I don't use weight watchers but I use FREE fruits and veggies! I know if I eat lots of veggies, proportion my food well and exercise I am doing it correctly. I do get excited over recipes with 3ish PP points that satisfy my taste buds! Thank you for all of the information! I lost 50lb. with WW online many years ago. I think it's an awesome program and if you can afford it, or get it free then great. Nowadays there are so many online options that rock. Sparkpeople is a fantastic site and is, in fact, how I stumbled across your blog. Lots of supportive people and tools to track daily food. Oh- and FREE!! My Fitness Pal is my favorite. I love the fact that once you log your exercise, the calories you earned are automatically added to your remaining daily calorie balance. Similar to the activity points in Weight Watchers. Sparkpeople doesn't have that option (at least I know of) and oh boy if I workout I really want the option to eat those extra calories!!! Have you ever tried My Fitness Pal? I'm curious how activity points and calories burned equate. I'm also trying to figure out how you get 32 PP per day. I weigh more than you and even if I selected the "Doing physically hard work most of the time? score 6" I can't get to 32 points allowed per day for me. Just curiousity. I'm in maintenance, so I'm not trying to lose weight anymore. When I reached goal weight, WW gave me a pamphlet that tells you how to do maintenance--which starts with adding 6 PP per day. I was at 26 PP per day, so 26+6=32 PP per day for maintenance. Any guess as to how many calories 26PP was for you? I eat from 1200 to 1500 calories per day and am semi curious how many PP that is. Thanks! I thought that the activity points didn't cross over the days, if you didn't use them the day you earned them then they were gone. But you mentioned that you can save them up like your weekly points??? Yes, that surprised me, too! On WW Online (and the phone app), the activity PP are "stored" to use AFTER all of your 49 weekly PP are used up. So when you work out, you're essentially just adding to your 49 weekly PP. Nice post. I've done WW a couple times, but it just wasn't for me. It is a good tool for many people, though. I got hung up with weighing in in the evening (the only time I could make it). I prefer to weigh in in the morning before I eat. I would be so frustrated to go in there, knowing I had lost weight, but it not reflecting on the scale in the evening. Small things, but it was a deterrent for me. I'm also kind of cheap, and couldn't see paying for something I could do for free. For me it had the opposite effect. It it works for someone - great. I found SparkPeople with the calorie counting works better for me and keeps me more honest with myself. I have just started the WW 360 program on Feb. 2nd and I really like it so far. I started last year but only stuck with it for like 2 weeks before I just stopped tracking, I guess I wasn't ready to take full control of my eating habits. Now I am truly ready to do this and I also have an exercise routine in place. So far I have lost 3 pounds and that is just one week in. I like how I never feel hungry or deprived, which is two major issues I had with other diets, like Atkins, hated not having enough carbs! I also have tried South Beach diet and that was good but also too restrictive in my book. My parents are also doing WW and they have been on it longer and both have been losing weight. My quick story... I've done WW (meetings) in the past and that's how I lost my first 55 lbs. And kept it off. I've tried online a couple times since then but couldn't stick with it. Until now... I started again not quite a month ago and it's going well. I had done it last summer but didn't stick with it, but I think that was because I wasn't seeing the results I wanted to see. Now that I've accepted that I'm at a point where I'm not going to see huge results, I'm doing a lot better with it. This post inspired me to write a little most updating my recent WW experience on my blog (http://www.littlemisspowerful.com). I hope you don't mind me posting that here. I am a Lifetime WW member and have maintained my goal weight for 10 months. I really like the program and it has given me the tools to get the weight off and keep it off. But like you say, it's what you put into the program. The only thing that I do not like about WW is that they do not have a good plan in place for Lifetimers. The meetings are usually about losing and I dont need to do that anymore. They only require lifetimers to weigh in once a month as well. It's kinda like "Welp, you made it now sink or swim." I think they should have at least 2 meetings a month if not more just for lifetime members so that we can learn better ways of coping when you no longer get the "losing high". Also, for those that might be in financial hard spot, WW does offer scholarships. Actually, I was on scholarship the entire time that I was losing. My doctor recommended WW and the meeting fee was just too much. I was the only one working as my husband had been laid off and was going back to school. So I applied and was able to go to the meetings for a very low price. It wasn't free but it was substainally lower. I have been a member of WW since 2008 and have lost 80 pounds. Once you reach goal and achieve lifetime status you don't have to pay for meetings unless you go over goal or miss weighing in during a calendar month. I found that WW gave me a level of accountability keeping me on track knowing that I needed to weigh in. I have maintained for over 3 years now and still count PP when I find myself slipping and getting a little lax. Thank you for this explanation. I've been considering WW since I can't do any activity for a while. I fear gaining back all the weight I've lost! But if it's not much different than counting calories and it'll take a bit of time to learn the new system, I'm not sure it matters. Unless it ends up being more about being accountable! I'm just starting WW, and I'm wondering about swapping activity points for food. I'm a pretty active person who cycles, swims laps, plays roller derby, and does aerobics/circuit training classes at the Y. Actually, in the past, I've used exercise as an excuse for eating giant portions of healthy things, and that's why I'm appreciating the way WW is making me think about portions. However, I'm wondering if you think I should use all of my activity points for food. Sometimes I think maybe I SHOULD in order to replenish myself and keep me full from the activity. Other times I wonder if they are overestimating the points value of the activity or if I will lose weight by just eating back what I exercised. In my experience, I've always eaten all of my activity PointsPlus (both losing weight and maintaining). However, I've learned that WW does overestimate how much I've burned. When I got an ActiveLink, it was giving me more than double the amount of PP I was manually counting, and I gained a few pounds. So I went back to the old-fashioned way that has worked for me. I take the calories I've burned during exercise and divide by 80, then round UP to the next whole number, and that's the amount of activity PP I give myself. I eat ALL of them. The amount of food you're allowed on WW isn't enough for someone as active as we are unless you also eat the activity PP (in my opinion). I also eat all of my weekly PP. This is SO helpful. Thanks a lot. Yeah, I can feel that I'm doing better about thinking about what I eat with WW, but I am hungry because I'm active. I don't have the activelink...I've just been entering the activity into the activity tracker and playing around with combining different activities and estimating the amount of time I've spent doing it. Do you think the activity tracker over estimates point values for the activities? I ONLY enter my intentional exercise (running) into the tracker. I don't calculate the housework, a walk around the block, etc. for my AP's. When done this way, the activity tracker gives me slightly more AP's than when I use the calories/80 formula. It's pretty close, though! I see posts from you about your "thoughts on WW" from 2011, 2012 and now 2013. It seems like you change your mind alot about how you feel about the program. I am wondering why? I know the program has changed a lot in the past few years but the basic structure of how the program works is the same. Hmm, I've only changed my mind once, really; I liked the old Points program, and when they switched to the PointsPlus ( a MAJOR change), I didn't like it (which I explained in the post that you read). Then I decided to give it another try, after being off of Weight Watchers for a long time, and I found I really liked it (or "changed my mind" about it). This was so good to read, I think that I need to start eating my activity points. Lately I've been feeling SUPER deprived and then my good intentions go out the window and I eat everything that isn't nailed down!! I'm trying to get back on track after an awful gain *15lbs* and I think I need to stop worrying about how fast I lose, or getting back to where I was (which wasn't even at goal yet!) I need to just focus on staying on track, and depriving myself isn't going to work. Thanks! !